If an elevator ride of more than 30 seconds leaves you feeling antsy, then a ride in the elevator proposed by a Japanese construction firm is probably not for you. Obayashi Corp. this week outlined its plans to build an elevator that would take its occupants just over seven days to reach its destination. The reason for the long ride? The terminal station would be located 22,400 miles (36,000 km) above Earth. 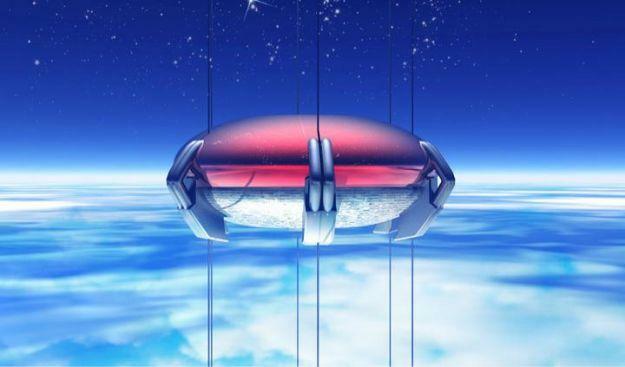 The Tokyo-based company said its so-called space elevator could be ready by 2050. Engineers hope to make steady progress with the project “so that it won’t end up as simply a dream,” an Obayashi official told The Daily Yomiuri. The company said that such a feat has been made possible thanks to the 1991 discovery of carbon nanotubes, which are around 20 times stronger than steel. These would be used to produce the necessary cables for the space elevator. Obayashi’s plan involves sending a cable 60,000 miles (96,000 km) into space, roughly a quarter of the distance between Earth and the moon. One end of the cable would be fixed to the ground around which a spaceport would be built, while the other would be fitted with a counterweight, an official said. The elevator, containing up to 30 people and traveling at a speed of 125 mph (200 kph), would be powered using magnetic linear motors. The terminal station, containing laboratories and a living area, would be located 22,400 miles (36,000 km) up. The idea of a space elevator is not as far fetched as it might initially sound, with the Daily Yomiuri reporting other organizations, such as the US National Aeronautics and Space Administration, taking an interest in such a project. Officials at Obayashi say the viability of the project rests on the cost of carbon nanotubes and whether the firm can get the cooperation of other companies from around the world.